Definition at line 42 of file ndn-l3-rate-tracer.hpp. 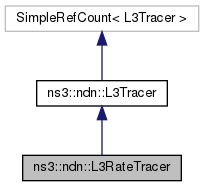 Trace constructor that attaches to the node using node pointer. Definition at line 169 of file ndn-l3-rate-tracer.cpp. 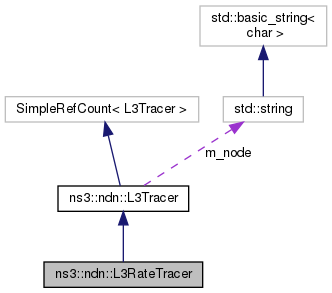 Trace constructor that attaches to the node using node name. Definition at line 176 of file ndn-l3-rate-tracer.cpp. Definition at line 183 of file ndn-l3-rate-tracer.cpp. Definition at line 50 of file ndn-l3-rate-tracer.cpp. Helper method to install tracers on the selected simulation nodes. Definition at line 84 of file ndn-l3-rate-tracer.cpp. Helper method to install tracers on a specific simulation node. Definition at line 122 of file ndn-l3-rate-tracer.cpp. Definition at line 44 of file ndn-l3-rate-tracer.cpp. Definition at line 158 of file ndn-l3-rate-tracer.cpp. Definition at line 206 of file ndn-l3-rate-tracer.cpp. Definition at line 262 of file ndn-l3-rate-tracer.cpp. Definition at line 297 of file ndn-l3-rate-tracer.cpp. Definition at line 308 of file ndn-l3-rate-tracer.cpp. Definition at line 319 of file ndn-l3-rate-tracer.cpp. Definition at line 330 of file ndn-l3-rate-tracer.cpp. Definition at line 341 of file ndn-l3-rate-tracer.cpp. References ndn::lp::Nack::getInterest(), ndn::Interest::hasWire(), and ndn::Interest::wireEncode(). Definition at line 352 of file ndn-l3-rate-tracer.cpp. Definition at line 363 of file ndn-l3-rate-tracer.cpp. References nfd::pit::Entry::getInRecords(), nfd::pit::Entry::getOutRecords(), and nfd::face::INVALID_FACEID. Definition at line 380 of file ndn-l3-rate-tracer.cpp.